Samsung's flagship device, the Galaxy S4 will finally be unveiled several hours from now. Successor to the insanely popular Galaxy S3 device, this new offering from the Korean giant is all set to wow the Android fanbase. Speculations, rumors, and even "confirmed" features are all that you see on tech news sites. After all, this is the best smartphone in the world and it has to live up to the expectations. Samsung, on the other hand, has taken all efforts to ensure that there is enough hype created before the release. They have launched a couple of ads that help in building up the excitement towards the big event. Furthermore, banners, ads, and giant hoardings are all indicating that Samsung is bringing something big for its fans. As big as the hype seems, passionate Android users are satisfied only with the best. So, needless to say, we have our own expectations from of this upcoming Android super smartphone. We want the device to be a blend of all the things we have on our "secret smartphone wishlist" that we keep tucked right under our beds. Rumors are that the last Samsung device was also a result of our idea to send our secret smartphone wish list to the Korean giant (this will be our little secret shhhh..). Anyways, before you start wondering whether we expect Samsung to make intergalactic phone calls, it is time to unveil what we really expect from our beloved Samsung. Duh! If it's a new device, it will have a new processor. No, seriously. We want the fastest in the market. The breeziest one that can do ten things at once. Okay, let's slow down. What we really expect from Samsung is a processor that hasn't been used in any other device and is the fastest one around. What the rumor mills are saying is that the Galaxy S4 will feature the new Exynos 5 Octa mobile processor that Samsung tweeted out recently. Many rumors are pointing towards this processor being included in the final version. The chip has eight cores and is based on AMD's big.LITTLE architecture. One of the smartest things you'll find in this chip is that some cores will automatically shut down whenever they are not in use thus conserving the battery life. As far as the RAM is concerned, 2GB or more would be great. We expect Samsung to deliver a slimmer smartphone than the previous Galaxies; however, it shouldn't be any bigger than the Galaxy S3. With the recent trend of "Grand" phones taking over, the Galaxy S4 should shy away from making an almost phablet-looking phone. Instead, it should be a phone that fits nicely into our palms and lets us reach all corners of our device using simply one hand. As to how the device will finally look like, no one knows; however, pictures of the device were allegedly leaked on a Chinese forum pointing towards a much slimmer device that looks almost the same as the Galaxy S3. Now many tech experts are saying that the reports are fake and that the phone in the pictures is nothing but Samsung Galaxy S3. We'll have to wait and see as to how the device actually looks like when it comes out. It is rumored that Samsung will launch a full-HD 5-inch display for its new device. 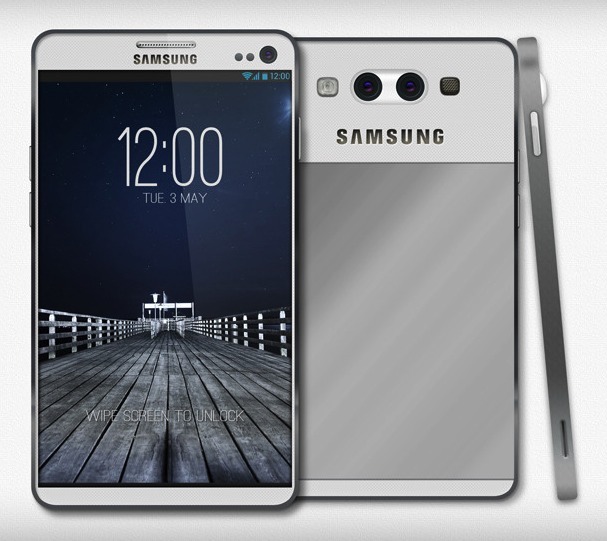 One rumor from Sammobile suggests that the Galaxy S4 will feature a floating-touch display. This new feature will let you use your finger as a cursor so that you can hover over a photo album to get a preview of what is inside it. Another rumor about the display is that the S4 will use a new AMOLED material known as green PHOLED that will make the standard AMOLED display 25% more efficient. What we want is a display that tops the Apple's retina display yet saves an insane amount of battery life. Rumors suggest that the Samsung Galaxy S4 will have a 13-Megapixel camera with new Samsung Orb technology that lets you capture 360-degree photos like Photosphere. What we expect from Samsung is a camera that is quick and lets you capture multiple snaps without any lag. Also, full HD recording and other standard features would be good to have. Another feature we might see is a better front-facing camera from Samsung. Let's hope Samsung doesn't bring something that burns a hole into our pockets. With the launch of Nexus 4, many people are expecting Samsung to lower the prices of its devices. But again, Samsung is known to be on the expensive side so, you never know. One thing that SHOULD be there is Android Jelly Bean updated to the very latest version. What we also need is a newer version of the TouchWiz UI. If you compare the vanilla Jelly Bean UI to the TouchWiz UI of say Galaxy S3, you'll be disappointed at what Samsung has done. Many rumors are also suggesting that the Galaxy S4 will have an updated version of the TouchWiz UI. Let's keep our fingers crossed for this one. We are all excited about the Samsung event in New York. With its soaring popularity, Samsung is raising the bar of smartphones each year. It looks like Samsung is becoming the new Apple in the eyes of consumers. Let's hope the Galaxy S4 will not disappoint.